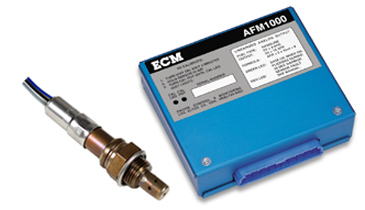 The professional AFM1000 Air Fuel Ratio (AFR) combustion monitor is an accurate, economical, small, lightweight electronic tool for today's technician. This tool is essential for correctly monitoring the AFM and then adjusting the fuel delivery quantity to any engine. This can be used on carbureted engines, but is a necessity for calibration or mapping of any electronic fuel injected (EFI) engine. A UEGO sensor is installed in the exhaust system, the AFM1000 performs the analysis, and the data is presented as a fully linearized 0-5 volt output. It is easy to interface the linearized output signal to any data logging system or engine dynamometer system. All engines, that are required to accelerate, develop maximum engine torque and power when operated at a rich air fuel ratio. The best method for determining the real engine air fuel ratio is by measuring the combustion exhaust gas with a UEGO (Universal Exhaust Gas Oxygen) sensor. The UEGO sensor is a state of the art, 5 wire, wide range sensor that allows the AFM1000 to determine the AFR by measuring the combustion exhaust. This technology does not use the old method of using an O2 sensor that attempts to calculate the rich AFR by measuring the small amount of oxygen in the exhaust. Calibration procedure is very simple. To calibrate the system, remove the sensor from the exhaust system, place the sensor in AIR for a few minutes, and adjust the air calibration adjustment. This will assure accurate and consistent readings throughout every operation. The AFM1000 will perform well on any engine that is fueled by gasoline or any of these optional fuels which include, methanol, ethanol, methane, diesel, LPG, or propane. The AFM1000 is suitable for use to precisely determine the rich AFR in a racing car or for a dynamometer used to develop a racing engine. Customer satisfaction guaranteed or your money refunded. "Discounted for Racer and Dynamometer Customers."